India sent an all-purpose Earth observation satellite into orbit early Monday, replenishing the country's fleet of mapping spacecraft for resource planning and security applications. 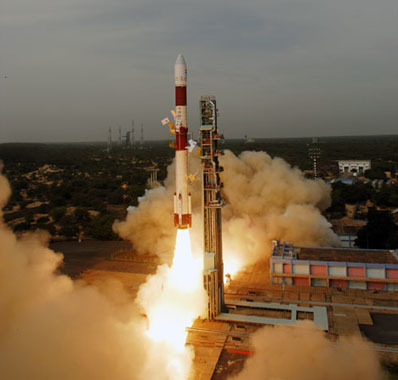 The Polar Satellite Launch Vehicle lifted off at 0352 GMT Monday (11:52 p.m. EDT Sunday) from the Satish Dhawan Space Center on India's east coast, where it was 9:22 a.m. local time. The 146-foot-tall rocket soared into clear skies and flew southeast from the launch site. The four-stage launcher reached a 395-mile-high orbit approximately 17 minutes after liftoff, according to the Indian Space Research Organization. The PSLV released Cartosat 2B, the mission's primary payload, less than 40 seconds later, ISRO announced. After jettisoning a dual satellite adapter, the rocket's fourth stage deployed an Algerian remote sensing satellite and three student-built spacecraft to complete the launch sequence. The PSLV was flying in its core-alone configuration without six solid rocket boosters. Indian space officials declared the flight a complete success during a celebratory press conference. 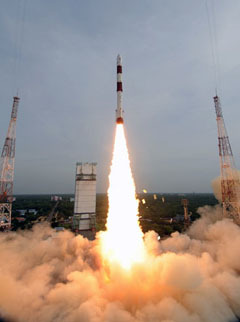 "I'm extremely happy to say that the PSLV had an excellent flight," said K. Radhakrishnan, chairman of ISRO. "The 16th successive successful flight injected precisely five satellites [into orbit]." The perfect blastoff occurred less than three months after ISRO was hit by a sobering failure of the Geosynchronous Satellite Launch Vehicle, the country's largest rocket. ISRO attributed the mishap to a problem in the liquid hydrogen turbopump of the GSLV's cryogenic third stage. The April 15 launch was the first flight of the Indian-built third stage, which was developed to replace a Russian engine used on the GSLV's previous missions. The launch of the workhorse PSLV came as India begins fixing the problem that plagued the GSLV mission in April. In a statement last week, ISRO said the indigenous GSLV third stage would fly again within a year. Several former ISRO chairmen and at least one senior government official attended Monday's launch and congratulated teams responsible for the success. "It's been a wonderful experience," said Montek Singh Ahluwalia, deputy chairman of India's Planning Commission. "Congratulations to all of you on a perfect take-off. I know that ISRO makes the country proud." The launch was delayed more than two months from early May after workers found a marginal drop in the pressure of the PSLV's liquid-fueled second stage during standard testing. The stage was sent to another ISRO facility for repairs, then returned to the launch site to resume launch preparations. 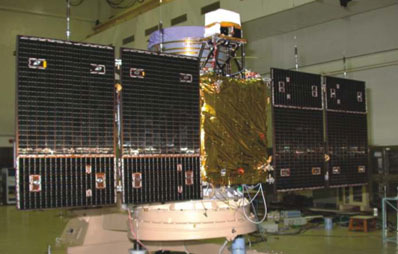 Cartosat 2B is India's third satellite with a peak imaging resolution of less than one meter. The 1,530-pound spacecraft's black-and-white camera has a resolution of 0.8 meters, or approximately 2.6 feet, giving users close views of cities, neighborhoods, natural resources and military sites around the world. The imagery will have applications in resource mapping, urban planning, transportation studies, water monitoring, and crop inventories, according to ISRO. Cartosat 2B is the 10th member of the Indian Remote Sensing satellite fleet, joining other platforms observing Earth's land and ocean surfaces from orbit. Monday's flight also orbited the Alsat 2A remote sensing satellite for Algeria. Built by EADS Astrium of France, the spacecraft carries an imaging instrument with a maximum resolution of 2.5 meters, or 8.2 feet. Alsat 2A is the first of two satellites Astrium is building for Algeria under an export cooperation contract. Alsat 2B will be assembled in Algeria with help from Astrium. Algeria plans to use the satellites in cartography, agriculture and forestry management, mineral and oil resource monitoring, crop protection, and disaster response planning, according to Astrium. A 14-pound satellite to demonstrate maritime ship-tracking technologies was also launched aboard the PSLV. Named AISSat 1, the craft was built by the University of Toronto Institute for Aerospace Studies for the Norwegian government. Norway plans to test the satellite's ability to track shipping traffic with the Automatic Identification System, a radio communications network with transmitters on most large vessels. 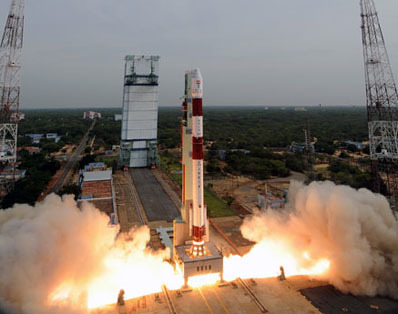 Two more small satellites, TIsat 1 and Studsat, were launched Monday for Swiss and Indian university students.